This list shows common issues with the debugger and their solutions, so you can solve problems quickly. In case you could not find an answer here, please feel free to ask on our Support forum. 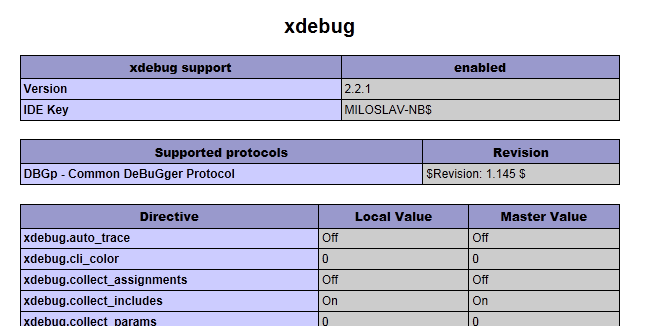 Check whether Xdebug extension is loaded. The correct output is depicted bellow. 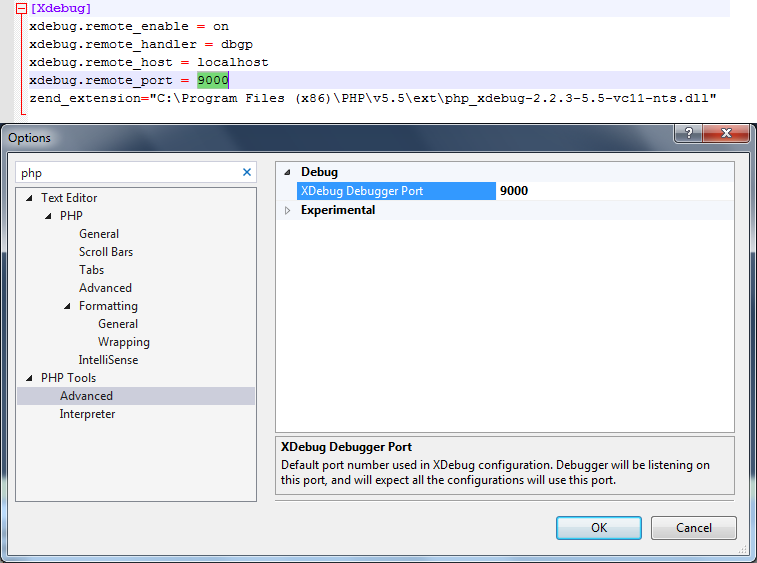 Ensure xdebug.remote_port directive in php.ini is matching the settings in your Visual Studio (Tools | Options | PHP Tools | Advanced). Ensure you are using a PHP Web Project, not an ASP.NET Web Site. You can convert web to the PHP project from menu. WAMP setup installs its own PHP configuration. To use WAMP installation with PHP Tools, set up Custom Server in your project properties and ensure php.ini corresponding to your WAMP server is configured properly. PHP Tools does not check for php.ini in WAMP installation. Ensure that your first loaded page is syntax-error-free, and that there are not two functions with the same name. The debugger does not handle parse error on the entering script. I get this message in the output window: "There wasn't established any directory mapping. Debugging most likely won't work correctly." Make sure the file you are requesting as the first one is included in your project. Automatic mapping mechanism requires that a file is part of the project in order to map it correctly. I can't get the debugger to work. I'm running Zend Framework. Is that a known issue? Make sure ZendExtensionManager loads after Xdebug (switch the order in php.ini); or comment it out completely. Turn off zend_optimizer. There is a known issue with Xdebug causing debugging sessions to stop working for the current request. You have to use set_error_handler() function to catch errors and to use QuickWatch, Watch or Immediate window to evaluate an expression throwing an error. This combination makes Xdebug unusable for the rest of the request. As a workaround, it is recommended not to call set_error_handler() in your code when debugging. "Stepping through code works, but PHP exceptions are not thrown in Visual Studio"
Check your php.ini for xdebug.default_enable directive and make sure it is set to 1 (this is a default value). "Debugger won't work when 'Don't open a page. Wait for a request from an external application' is set in the project settings." to php.ini file in the Xdebug configuration section which will force it to start on every request.